Just Pull It Up To Turn It On! Atomic Beam® Lantern Is Great! Easy to use for Camping • Boating • Hunting • Cookouts • Sleepovers and much more! Don't be stuck holding your flashlight all night! Atomic Beam® Lantern is the ultra-bright, portable light! READ FULL DESCRIPTION Unlike and ordinary flashlight that shines in one direction, Atomic Beam® Lantern gives 360 degrees of light. Normal LED lanterns pale in comparison; Atomic Beam® Lantern has LED flat panels that are brighter and stronger than other lights. Using Atomic Beam® Lantern is easy. Pull up when you want to turn on. Or push down when you want to turn it off. The Atomic Beam® Lantern is compact and lightweight. It's super light and packs up tight. Atomic Beam® Lantern is the ultimate light for camping, hiking, and emergencies. Plus, it has a magnetic bottom. Attach it to any metal surface! Atomic Beam® Lantern holds on tight and still stays bright. 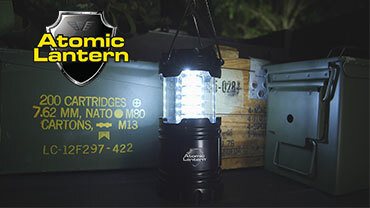 You can get your Atomic Beam® Lantern today for just $19.99 and pay NO SHIPPING & HANDLING! And when you order you'll receive a FREE upgrade to the Atomic Lantern with magnetic base. As our way of saying thanks, you can get a second Atomic Beam® Lantern PLUS an LED Flashlight, the ulta-bright military grade flashlight. Just pay a separate fee of $9.99. If you want an even brighter lantern, you can now upgrade the Atomic Beam® Lantern to the special deluxe edition. It's bigger and 2 times brighter! Get the Deluxe Atomic Beam® Lantern for just $32.98 and you still get FREE shipping and handling. Hurry and place your orders now! Atomic Beam® Lantern Is Ultra Tough! Purchase your Atomic Beam Lantern for just $19.99 NO SHIPPING & HANDLING. Receive a FREE upgrade to the Atomic Lantern with magnetic base just for ordering today. You can also take advantage of our Special Offer and receive a SECOND Atomic Beam Lantern PLUS an LED Flashlight for a separate fee of just $9.99. Order Today! Select Your Offer Above And See The Atomic Beam® Lantern Difference! Hear from other Atomic Beam® Lantern customers how much they love it, and why you will too! Check out all the news for Atomic Beam® Lantern and its creators at TeleBrands featured all over the world.